Featuring CFA artists Song Dong(宋冬), Wang Dongling(王冬齡), QIU Zhijie(邱志傑), and CUI Fei(崔斐), among many other important Chinese artists. The unique culture of writing that has shaped China for more than 3,000 years is an important reason for the cultural continuity and cohesion that accord China a special place in world history. The exhibition illuminates all aspects of this tradition, highlighting the many different functions ascribed to Chinese writing over the centuries. 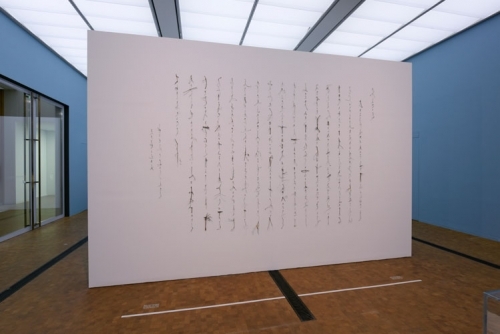 Regardless of whether or not one masters the Chinese language, the exhibition offers fascinating insights into the social, political and cultural dimensions of Chinese script. The exhibition invites visitors to discover the world of Chinese characters, from the earliest recorded writing all the way to contemporary art. Alongside works of art by China’s most famous calligraphers from the eleventh to the twentieth century, a host of other objects will be presented. Ranging from ancient bronze vessels and animal bones bearing messages to divine beings to religious manuscripts, poetic ink paintings, Buddhist sculptures, seals and rubbings of inscriptions on monumental stone steles, the exhibits illustrate the manifold functions of writing in Chinese culture. They not only embody the quest for aesthetic perfection, intellectual brilliance, religious yearnings and meditative contemplation, but also tell gripping and surprising stories of loyal civil servants and defiant rebel artists, of moral cultivation and political propaganda, of gatherings of poets merry with wine and of mystical communing with nature. This exhibition will thus be the first to examine all aspects of Chinese calligraphy, from its beginnings until our time.